There’s never a dull moment here at Community Hostel. If you’re looking for something to do, join us for one of our many social nights hosted at the hostel. Show off your favorite recipe in a potluck dinner, cozy up for a movie night, or jam out with us in one of our open mics. Come stay with us at Community Hostel! With so many things to see and do, we guarantee you the best experience on the Equator! We offer several styles of accommodation to fulfill the needs of every traveler, including dormitory,private, and single gender rooms (female only). Our beds are the most comfortable in Quito, handmade by a local artisan carpenter. Sip on some tea or coffee from one of our two seated balconies and take in the beauty of an Ecuadorian sunrise or sunset while overlooking the city. Each traveler is provided a Large, lockable personal storage drawer underneath your bed to store your items. We offer four computers fully loaded with skype and internet access, and free wifi within the hostel so that you can quickly and easily keep in touch with your families and loved ones. If you’re hungry you can help yourself to our fully equipped communal kitchen, or take a walk down the road to one of the many local cafes and shops. 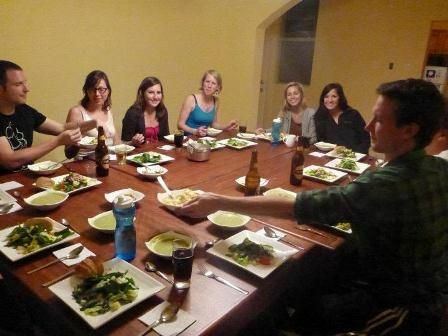 We also offer communal dinners and breakfasts provided by our foodie staff. From Airport: By Bus: Take the trole bus in a southbound direction and get off on the "Plaza del Teatro "stop from there walk across the plaza down calle Flores and make a right when you pass the Mercado central. We are the a three story colonial house across from the palm tree! By Car: to arrive by car you would need to take calle diez de agosto southbound and pass parque "La Alameda" continue on avenida Pichincha towards the "plaza del Teatro" and then make a left on calle Olmedo. By Taxi- Please include Taxi fare: For a safe & secure ride, we have partnered with a licensed taxi cooperative, Cooperativa de Taxis Coliseo Julio Cesar Hidalgo. They will carry a car-full for $35 total. If you are interested in hiring a driver from our partnered cooperative, please feel free to call us and set an appointment.If you choose to take a local cab, please be aware of your belongings and meter prices. 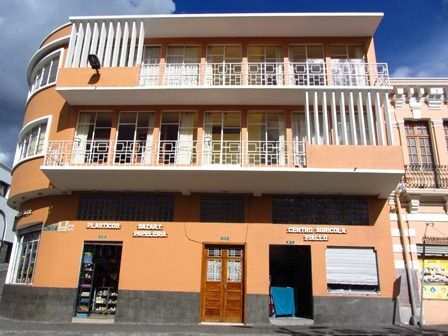 If you are wary or unsure of how to get to Community Hostel, please feel free to call us and ask for information.If you're taking a local cab, here is a simple way to ask a cab to get to Community Hostel: "Por favor a la Pedro Fermín Cevallos y Olmedo detrás del Coliseo Julio Cesar Hidalgo y Mercado Central."